While traveling on Greyhound buses I was attacked by passengers, security guards, janitors, & Greyhound employees. These Multi-National Force (MNF) warfighters functioned as a single unit, because they were brain-linked to the Global Information Grid (GIG), that guided them with computer-generated attack formations. Travelers regularly used their luggage as virtual & actual impact weapons. Greyhound employees worked with janitors, security guards, & passengers to antagonize me. Multiple times they gave me false information (that was probably deliberately deceptive). They were basically incompetent & rude. The people buzzing around me at Greyhound bus stations created steady audiovisual commotion. It included: janitors wheeling barrels & slamming dustpans around me; loud fake coughs; sham laughter; people throwing luggage near me (acoustic & physical attacks that shook the bench); & screaming. 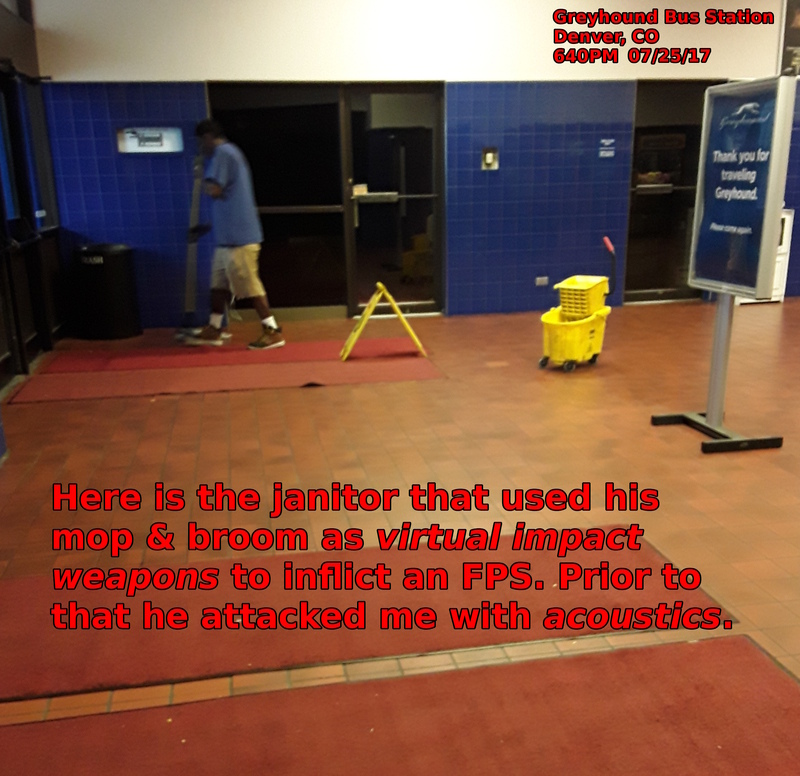 Some janitors attacked me with fear-potentiated startles (FPS) by shoving mops & dustpans near my feat. The approach of one janitor was synchronized with a spike in directed-energy pain. While waiting in line to board the buses, security guards, Greyhound employees, & passengers cut through the line at my exact area, (to the exclusion of all easier routes), in order to unsettle me. During this time I was struck by the people in back, who swung luggage into my torso & legs. Twice during the crowding/FPS & physical strikes, they had children running around screaming for an acoustic effect. One child slightly hit me while swinging his arms. [This tactic is quite common. Brain-linked toddlers will run at you while screaming & swinging their arms to incite an FPS using motion & acoustics.] Multiple people cut me in line by just blatantly stepping in front of me. During this crowding/physical/acoustic/FPS attack combination, I was hit with directed-energy. Another common tactic to disturb me included using a rotation of citizens to approach & ask questions. 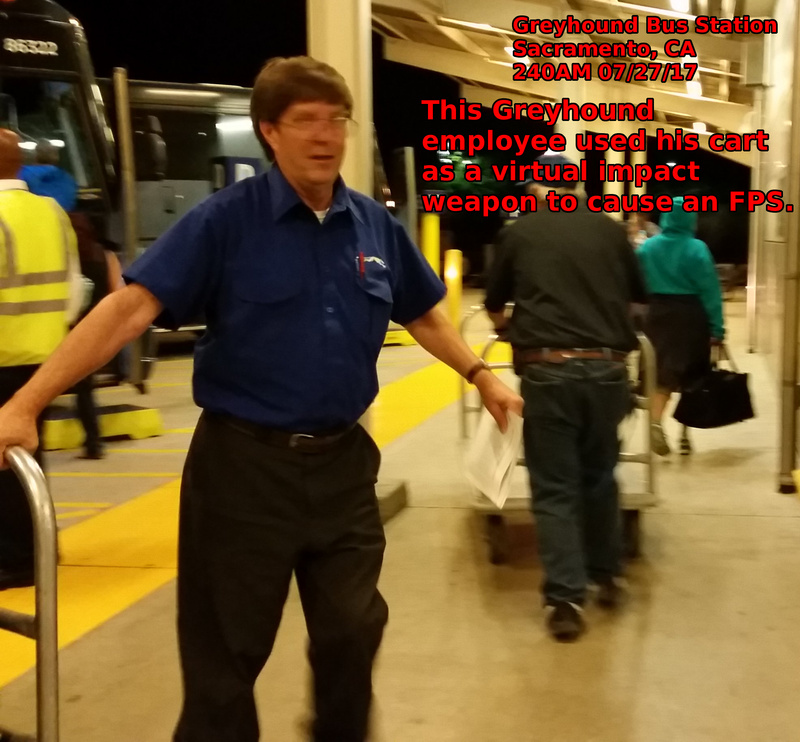 On the morning of 07/27/17 a Greyhound employee used a luggage cart as a virtual impact weapon. This FPS attack happened after the bus arrived late & the bus driver refused to answer me. "240AM. The bus driver did not make an announcement about when the bus left for Redding. It was scheduled to [arrive in Sacramento at 145AM &] depart at 250AM. This was incompetent [of him] because it left an hour late. I asked one of the greyhound employees & he said to ask the driver. I asked the driver (who was removing luggage from [the] bus) & he pretended not to hear me. I asked him again & he ignored me. I finally shouted & he said to wait in the station. ... After not answering my question & ignoring me, the same bus driver [along] with another greyhound employee, virtually attacked me with [a] cart." 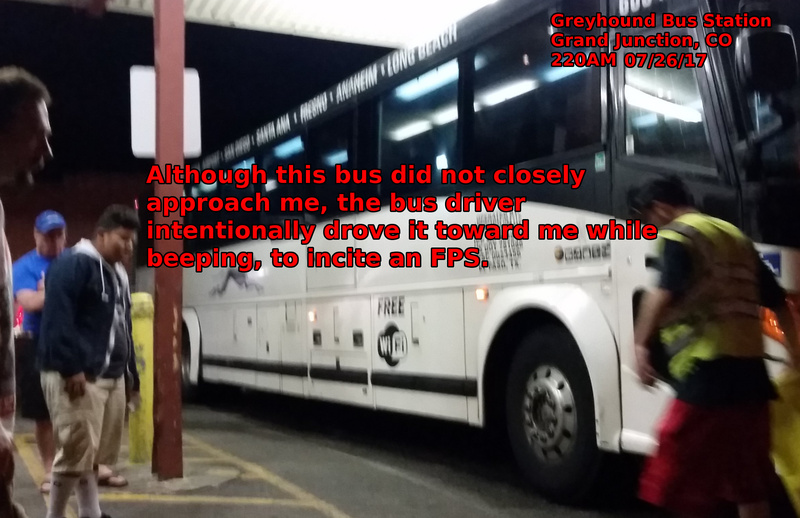 On 07/26/17, in Grand Junction, CO, at about 220AM, another Greyhound bus driver used a bus as a virtual impact weapon, to inflict an FPS. Even though the bus did not closely approach me, it was driven toward me on a collision course while beeping. I was situated near the exit of the lot, away from the crowd of people waiting to board the bus. The excuse used for the attack was that the bus had to drive near the exact area I stood, in order to back up, & more closely align itself with the station. That seemed entirely unnecessary to me, because the lengthy path it took toward the station allowed it plenty of space to do that. While moving out of the way of the converging bus, a Greyhound employee blocked my movement. After the bus backed up into the lot & halted, I took a picture of it. At that moment, the same Greyhound employee who crowded me while I dodged the bus, approached me to say that pictures were forbidden. On buses, there was perpetual audiovisual havoc synchronized with directed-energy strikes, intrusive thought attacks, my web activity, & my movements (i.e., leaving seat, looking up, getting things out of my bag, removing headphones or earplugs). This audiovisual chaos included: fabricated crying; coughs & laughter that were recognizably fake; babbling that was scripted; people around me making quick fidgety movements & flailing their arms. One man shined a flashlight on me. Travelers & Greyhound employees would further disrupt me by placing their fingers on my shoulder to get my attention. The physical violence done on "accident" included passengers swinging their bags & containers into my shoulder & arm, while walking past my seat. Sometimes, this was done by an squad of people, one after the next. The physical violence was sometimes multidirectional. For instance, while being hit on the side, the people in back of me kicked my seat. In the 07/26/17 tweet I described that a Greyhound employee was part of a notably savage group attack, that occurred at the back of a bus in LA. On one occasion the girl in front of my stabbed my hand with her fingernail, when she happened to stretch at the exact moment I placed my hand on top of the seat to get up. I encountered more blockades & physical attacks when leaving my seat to visit the restroom or step off the bus. Sleep deprivation on the bus was accomplished with audiovisual commotion & directed-energy. The computer network operations (CNO) took the form of electrical & internet denial on my way to California, & frequent wireless router failures on the way back. The text file that I used to record the attacks was closed multiple times & sabotaged once. While writing in the file, the screen on the tablet PC kept flipping around, & there were persistent typos. Presumably at the direction of the DOD via the GIG, Greyhound created a series of mishaps, (including 2 bus breakdowns), to impede my return trip. 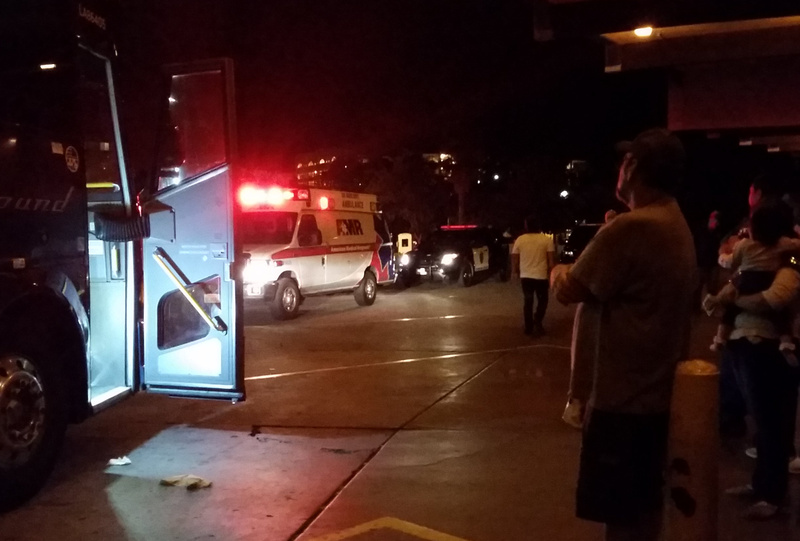 These contrived incidents left me stranded at bus stations & parking lots for over 20 hours. The photograph below shows a psychological action (PsyAct) conducted by police early in the morning on 07/30/17. We had to exit the bus while police officers boarded, seemingly to search for something illegal. This PsyAct was obviously intended to disturb & scare me. They used this tactic in 2010 during my trip to Sacramento. The loud fake conversations by the brain-linked citizens surrounding me, (who attacked me with physical violence & audiovisual commotion), included the typical blurts of PsyOp products (phrases) pertaining to my activities. On one occasion a physical attack on the bus was immediately referenced in a phony conversation. A PsyOp audio product blended into an announcement made by a bus driver was also used to tell me that I was under attack. 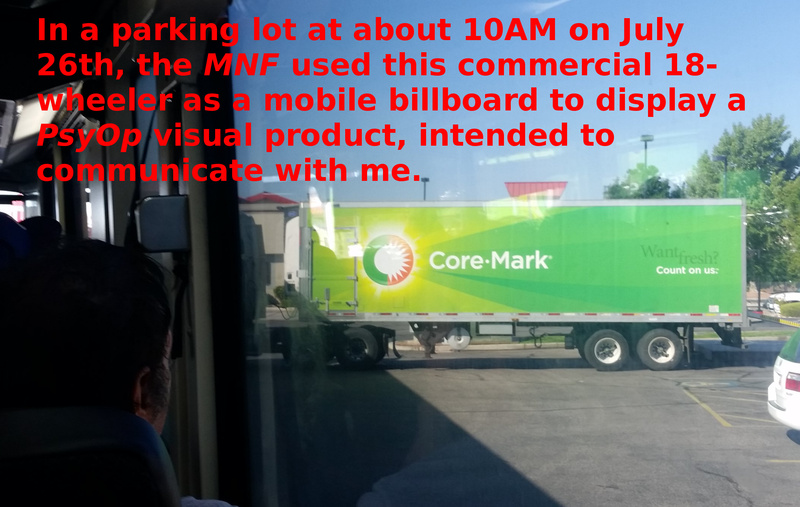 Just after I started writing about the 2nd staged bus malfunction in St. Louis, MO, that happened on the morning of 08/02/17, the MNF had a passenger appear in front of me (on a mostly empty bus) to flash a PsyOp visual product, that pertained to my effort to record the obstruction. 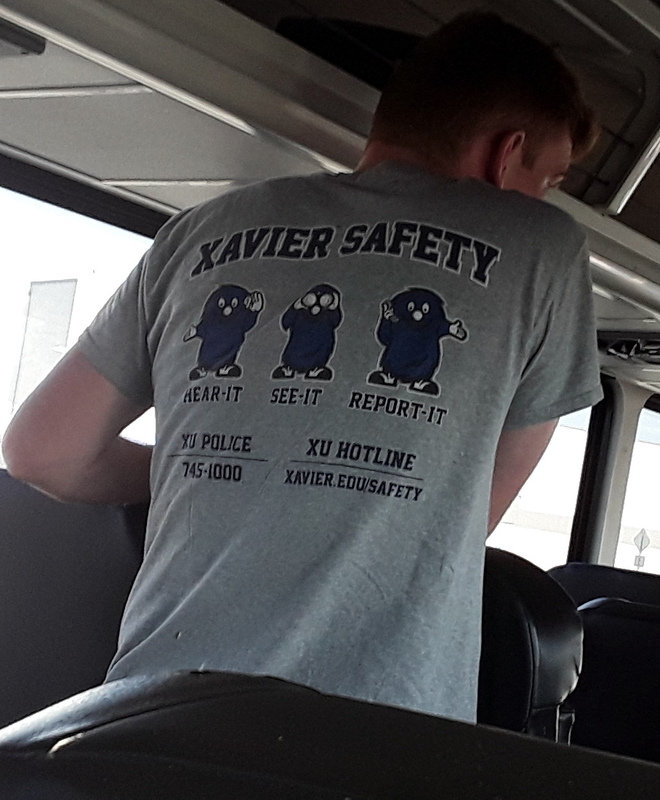 In the photograph below note the "See It" & "Report It" phrases, as well as the "Xu Hotline" (interpreted Zoo Hotline).